In a Nutshell: If ever there was an indication that digitization has hit every part of society, it may be the growing popularity of digital currencies. Thousands of merchants across the globe now accept digital currencies like Bitcoin and Ethereum, and millions of units have been bought and traded. In fact, Coinbase, one of the leading digital currency platforms, has exchanged $5 billion in digital currency to date through their mobile wallet app, consumer site Coinbase.com, and new trading platform, GDAX. With priorities aimed at their mission to “create an open financial system for the world,” Coinbase is steadily becoming the most trusted digital currency platform in the marketplace. Imagine a list of financial transactions. Each item on the list contains a little information about the item before it, as well as the exact time and date it was created, so the items always maintain the correct order. Then, imagine a copy of that list is distributed to computers all around the world, and those computers can compare each copy of the list against the others to ensure accuracy. Each time a new item is added to the list, all of the copies are updated so each shows a complete history of every transaction on the list — in perpetuity. Now, imagine that each item on the list is actually a block of information, with every block containing the records of all of the financial transactions that have occurred during that block’s lifetime. As each block connects to the block before it, they form a series — or chain — of blocks, known as a blockchain. Since its origination in late 2008, blockchain technology has caused a big stir in both the finance and technology fields, most notably for being the foundation of the new wave of digital currencies, headed by the increasingly ubiquitous Bitcoin. Digital currencies based on blockchain technology are considered to be secure from tampering and revisions, creating a safer way to complete currency transactions. Because the blockchain is hosted on computers all around the world, and run by a community rather than a single institution or government, digital currency is referred to as a decentralized way to transfer money, able to disregard country or currency — and all while involving fewer fees (and regulatory roadblocks) than traditional currency transactions. As a result, digital currencies like Bitcoin have been on the rise for the greater part of the last eight years. Indeed, proponents of Bitcoin, its ilk, and, especially, its foundational blockchain technology, believe it represents the future of finance. Despite, or perhaps because of, the future benefits of digital currency, many of its current users are cautiously optimistic. Though they’re mostly focused on trade and speculation, rather than replacing the cash in their wallets, the number of people using digital currency — and thus the number of digital currency transactions — has been steadily growing. 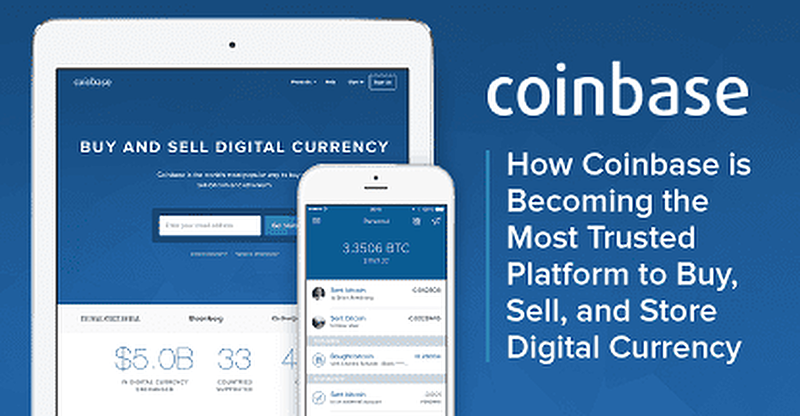 In fact, Coinbase alone has almost 5 million users, including 45,000 businesses who are buying, trading, and storing a variety of digital currencies, totaling around $5 billion in transactions to date. Users of Coinbase.com can buy, trade, or simply store Bitcoin, Ethereum, and Litecoin digital currencies. On the other side of the (digital) coin are the most serious players, users taking advantage of the GDAX trading platform. Intended to feel more like a traditional currency exchange site, GDAX appeals to the speculators and investors. Coinbase recently launched GDAX, a platform focused on digital currency trading and speculation. Merchants accepting digital currency through Coinbase can create a price-specific QR code, which can be scanned by the customer’s phone or tablet and accepted through their digital wallet. The transaction is verified by a member of the blockchain, then added to the current block of the chain. The Coinbase price chart for Bitcoin shows the continuously volatile nature of its value. Though growing in popularity as a payment method, some might hesitate to think of something like Bitcoin as a viable alternative to the mighty dollar due to its historically volatile market value. However, David believes that won’t always be the case. At its heart, Coinbase itself is a company speculating on the future of digital currency — and they see that future as bright. David compared the current stage of digital currency to the Internet in the mid-1990s, when it had only about 10 million users worldwide and hadn’t yet seen the explosive growth of the following decade. At the top of the Coinbase priority list is to become the most trusted platform for digital currency exchange and storage. The company hopes to lead the charge as a beacon of legitimacy in what is otherwise considered to be an under-regulated, highly complex market. “Coinbase really sees itself as the regulated player in the digital currency exchange market,” said David. “We want to be the trusted platform for anyone who wants to use digital currency.” In light of that goal, Coinbase has spent several years applying for various U.S. licenses, voluntarily taking on additional oversight to attain additional security in the eyes of consumers and merchants. It’s all well and good to be trustworthy, but that’s hardly helpful if no one can use your product. Coinbase hopes to make buying, selling, and storing digital currency not just safe, but accessible. They launched GDAX for larger traders, creating a place for speculators and investors. Then, they turned to Coinbase.com where they rolled out a new, streamlined, and easier-to-use commercial site, designed to help introduce digital currency to the mainstream audience. Coinbase users can pay for goods and services using digital currency through the Coinbase mobile wallet. In addition to the site revamp, they’ve also developed the Shift Debit Card, Coinbase’s solution to the hassle of using digital currency in point-of-sale situations. While the Coinbase digital wallet has always been available on mobile devices, it is limited to use with merchants who can create the proper QR code; Shift eliminates that roadblock. Between increasing accessibility, and working hard toward legitimizing — through regulation and reputation — the digital currency marketplace, Coinbase is hoping to help usher in a new era of finance for not just the online market, but for the entire world. “It will be much easier for anyone to create a business if there’s an open financial system,” said David. Despite the fact that blockchain technology and its brood of digital-currency offspring are becoming increasingly well-known, they have yet to break into mainstream society as a truly viable alternative to more traditional currencies. However, for companies like Coinbase — and their millions of users — the decentralized alternative simply hasn’t become fully viable yet.